Taunton, 65 @ Coyle & Cassidy, 61 – Final – Taunton ended the third quarter on a 9-3 run to tie the game (47-47) and then outscored Coyle 18-14 in the final quarter. The Tigers’ defense forced 20 turnovers to help hand Coyle just its third loss of the season. Senior Lens Esquil led the way with 14 points while Dante Law added 12 points. Junior John Martins chipped in with 10 points, including two clutch free throws in the final seconds. Prince Brown had two big three-pointers in the fourth quarter to help Taunton create separation. Stoughton, 0 @ Mansfield/Oliver Ames, 7 – Final – Click here for a photo gallery of this game. Franklin, 139.65 @ Norton, 133.8 – Final – Franklin posted its highest score of the season to beat Norton in a battle of young programs. The Panthers, in their second year, had junior Mia Lizotte win the All Around with a 36.55 while freshman Lexi Lupien placed with a 32.05. Vault – Mia Lizotte 9.25; Rachel Cyr 8.75; Lexi Lupien 8.7; Audrey DiMella 8.65. Bars – Lizotte 8.85; Liz Traphagen 8.7; Sadie Rondeau 8.5; Lupien 7.4. 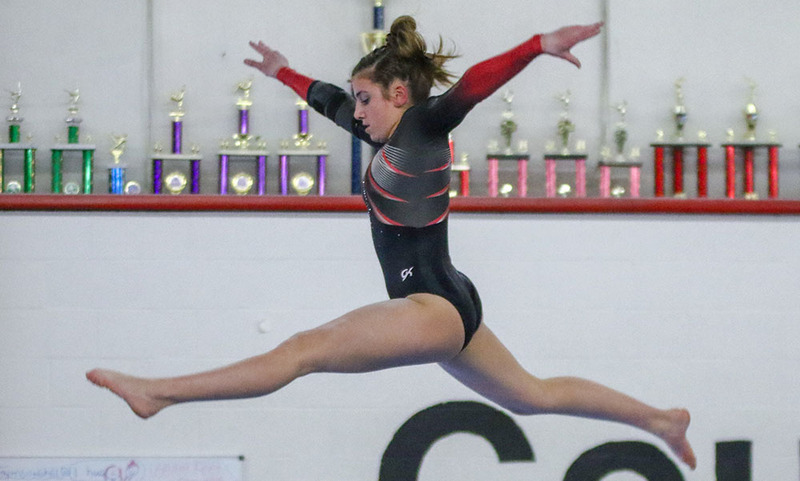 Beam – Lizotte 8.8; Rondeau 8.8; Traphagen 8.4; Molly Stanton 7.9; Lupien 7.2. Floor – Lizotte 9.65; Traphagen 9.4; Rondeau 9.15; Lupien 8.75. Canton, 1 @ Newburyport, 1 – Final – Canton junior Ryan Nolte scored in the first period to give the Bulldogs the lead but Newburyport scored a late equalizer in the third period to give each team a point. North Attleboro, 4 vs. Milton, 1 – Final – Drew Wissler scored a pair of goals and junior Jake Ebert scored his first goal of the season to help Big Red take down Milton. Jason McNeany also scored for the Rocketeers in the win. Oliver Ames, 1 @ Walpole, 3 – Final – Oliver Ames junior Adam Lyons scored once and the Tigers hit the post twice but suffered a setback against the Rebels. Sophomore goalie Owen Connor had a strong game in net with 23 saves. Franklin, 1 @ Brookline/Newton South, 0 – Final – Franklin senior Jackie Connelly scored the only goal of the game to help the Panthers earn a win on the road. Mansfield, 95 @ Foxboro, 62 – Final – 200 Med Relay – Matt Weiner, Jared Gabrilowitz, Sebastian Gwynne, Aden Schwartz (Mans) 1:53; Ben Dorman, Thomas Perry, Johnmichael Boucher, Dan Egan (Fox) 2:05; David Piccirilli Anthony Teebagy, Andrew Oppenheim, Mike Peel (Mans) 2:11. 200 Free – Matt Weiner (Mans) 2:16; Matt Whalen (Mans) 2:25; Michael Deasy (Mans) 2:43. 200 IM – Aden Schwartz (Mans) 2:32; Johnmichael Boucher (Fox) 2:37; Mike Peel (Mans) 2:38. 50 Free – Sebastian Gwynne (Mans) 24.59; Jared Gabrilowitz (Mans) 24.56; Dan Egan (Fox) 25.03. 100 Fly – Aden Schwartz (Mans) 1:11.63; Andrew Oppenheim (Mans) 1:11.69; Anthony Quartarone (Fox) 1:34; 100 Free – Dan Egan (Fox) 59.87; Mike Peel (Mans) 1:03; David Piccirilli (Mans) 1:08; 500 Free – Andrew Oppenheim (Mans) 6:20; Matt Whalen (Mans) 6:51; Thomas Perry (Fox) 6:52. 200 Free Relay – Johnmichael Boucher, Dimitri Davis, Thomas Perry, Dan Egan (Fox) 1:52; Andrew Oppenheim, Matt Whalen, Will Anderson, Mike Peel (Mans) 1:56; Michael Deasy, Thomas Hermendinger, Jason Haugen, Curtis Regan (Mans) 2:05. 100 Back – Sebastian Gwynne (Mans) 1:00; Matt Weiner (Mans) 1:10; David Piccirilli (Mans) 1:16. 100 Breaststroke – Johnmichael Boucher (Fox) 1:18; Kristian Andersen (Fox) 1:27; Dimitri Davis (Fox) 1:31. 400 Free Relay – Dimitri Davis, Jared Roke, Ben Dorman, Anir Gubbala (Fox) 5:09. Mansfield, 98 @ Foxboro, 72 – Final – 200 Med Relay – Claudia Beasley, Mairead Shannon, Ellie Leard, Jenn Prior (Mans) 2:06; Sarah Egan, Lindsey Nelson, Pam Nelson, Gina Ouellette (Fox) 2:09; Caitlin McCarthy, Colleen Cooney, Megan O’Brien, Laura Chaffee (Mans) 2:20. 200 Free – Pam Nelson (Fox) 2:07; Jenn Prior (Mans) 2:08; Laura Chaffee (Mans) 2:28. 200 IM – Pam Nelson (Fox) 2:27; Claudia Beasley (Mans) 2:34; Ellie Leard (Mans) 2:40. 50 Free – Jess Harris (Mans) 29.87; Rachel Nunes (Fox) 30.22; Amber Durant (Mans) 31.82. 100 Fly – Jess Harris (Mans) 1:11; Gina Ouellette (Fox) 1:13; Caitlin McCarthy (Mans) 1:18. 100 Free – Jenn Prior (Mans) 1:00; Molly Devoy (Mans) 1:07; Amber Durant (Mans) 1:11. 500 Free – Lindsey Nelson (Fox) 6:18; Laura Chaffee (Mans) 6:35; Lily Behn (Fox) 7:31. 200 Free Relay – Pam Nelson, Gina Ouellette, Lindsey Nelson, Rachel Nunes (Fox) 1:57; Caitlin McCarthy, Ellie Leard, Mairead Shannon, Jess Harris (Mans) 1:59; Faith Perry, Sarah Egan, Lily Behn, Jenna Stamatov (Fox) 2:09. 100 Backstroke – Claudia Beasley (Mans) 1:08; Mairead Shannon (Mans) 1:14; Julia Carangelo (Fox) 1:17. 100 Breaststroke – Lindsey Nelson (Fox) 1:22; Ellie Leard (Mans) 1:23; Molly Devoy (Mans) 1:25. 400 Free Relay – Claudia Beasley, Jess Harris, Laura Chaffee, Jenn Prior (Mans) 4:16; Sarah Egan, Jenna Stamatov, Faith Perry, Shannon Egan (Fox) 4:53; Colleen Cooney, Julia Burnham, Amber Durant, Molly Devoy (Mans) 4:57. 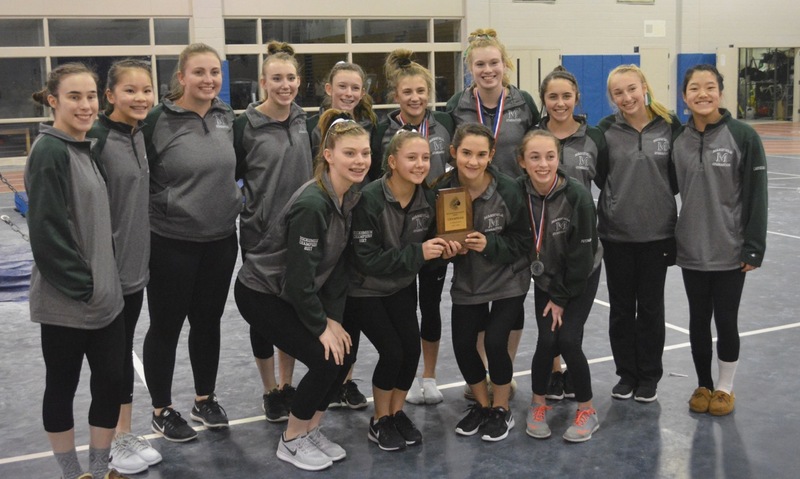 Franklin, 130.65 @ Canton, 105.50 – Final – Franklin senior Liz Traphagen won the All Around with a score of 34.7 while junior Sadie Rondeau was second, scoring an 8.5 on beam and 8.0 on floor. Mia Lizotte scored an 8.90 on vault and a 9.1 on floor, senior Molly Stanton’s score on beam, junior Rachel Cyr’s vault score, freshman Katelyn Guidi score on bars, and freshman Lexi Lupien’s scores on vault, beam and, floor all counted towards the Panthers’ win. Oliver Ames, 139.2 @ Taunton, 119.95 – Final – Oliver Ames senior Hannah Moynihan took first place in the All-Around with an impressive 36.15 to help the Tigers improve to 5-0. Moynihan scored a 9.1 on vault, 9.2 on bars, and 9.0 on the floor. Junior Gianna Martucci placed second with a 34.95 all around. Sophomore Lauren Picanzi contributed a 9.1 on bars. Other contributors for OA included senior Charis MacCuish, sophomore Tina O’Neill, and freshmen Ashlyn Latham and Kiara Nagle.